Profile page is where information related to your 5StarBot account can be adjusted. It is divided into several sections. Here you can edit your name and email. Email also serves as username to login into the bot, so don’t forget if you adjust it here. Your 5StarBot password can be changed here. By default you have three systems named System1, System2 and System3. You can give them new names, e.g. ‘Lay Horses’. Click ‘Rename’ link next to a system, enter a new name and click ‘Update’. You may need to re-login into the bot to see new system names in the top menu. There are a number of website themes. They control colours, fonts and overall look. 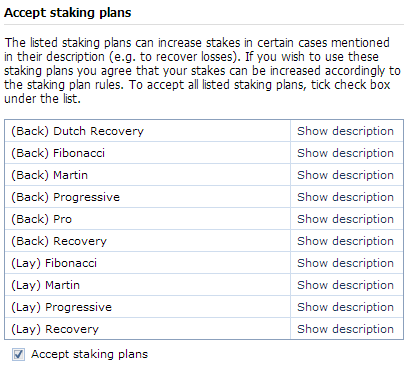 Certain staking plans involving significant increase in stakes require explicit acceptance that you acknowledge their rules. This protects you from use of unknown staking plans that if used carelessly may cause significant loss of money. You can accept use of all such staking plans in one place here or accept each plan individually every time you select it on “Staking Plan” page. This button allows to delete all your bets from History page. Bets cannot be restored after that. This option controls how to display the bot information on mobile devices with screen less than certain size. By default less important information in grids will be hidden on mobile phones (e.g. iPhone) to fit into the screen. However if you tick this box, the website will look exactly same on all devices. Disabling this option makes it easier to use the website on mobile phones.